Danny was born Henry Robert Chapman in Philadelphia to featherweight boxing champ, Danny McCabe, and taken to gyms where circus folk bought him at age nine as an apprentice. He remained in the circus except for three years in the U.S. Army during WWII. He balanced, flipped, and tumbled with The Duttons, The Clarkekonians, The Codonas, and The Flying Wards during the 1930’s on the Russel Bros. Circus, Tom Mix Circus, Barnett Bros. Circus, and Hagenbeck-Wallace Circus. A natural goof-off, he added comedy when he could. In 1940 he had a flying trapeze act working circuses, fairs, and parks. The army drafted him from Wallace Bros Circus. Regrouping as the Flying Robins, he spent 1948 on Ringling. He married Joan Bersche from Detroit and they had three daughters—Michelle, Deborah and Stephanie. Danny relocated to Sarasota, FL and built the Aerial Chapmans, a comedy revolving ladder act, that toured European circuses on Blackpool, Knie, Schumann, and Tivoli. He fell fifty feet at the Cirque Royal in Brussels and turned to fulltime clowning with a permanent slapping gait. He wrote a novel, Circus Buffoon, during convalescence. He married Sarah Wheeler in 1965 and they had a son and a daughter—Winston and Ivy. From 1962-1968 Danny clowned at Shrine Circuses and was producing clown on Carson & Barnes Circus twice. In 1968 along with Mel Miller and his wife Sarah, they conceptualized Clown College for Ringling Brothers and Barnum & Bailey Circus. Danny was the Headmaster at the 1968 Clown College and taught subsequent years at the school. He was Producing Clown on the 1968 Ringling Blue Unit and clowned on Ringling for six years. Danny spent 1975-1983 on shrine shows and as advance clown for Roberts Bros and Bartok Circus. 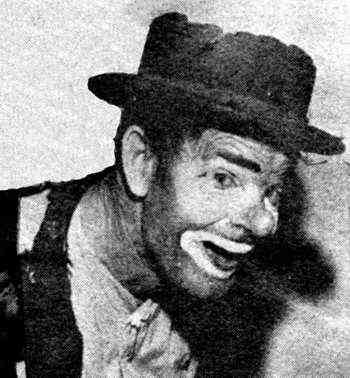 He clowned on Caribbean cruises and performed on George Hanneford’s winter circus. His contributions to clowning include playing a soda straw, standing a broom upright, and furthering pantomime in American clowning. His dream was to have a circus headline a clown.